H.B. Steele & Son recognizes the need for a domestic source of heating alternatives in the Southern Schuylkill and Northern Berks Counties that is not only environmentally friendly, but provides clean, safe heat for our friends and neighbors. After looking at the different arrays of options available, we believe that energy-efficient wood pellets are the best domestic heat source available today. We are proud to offer two brands of wood pellets, each a leading manufacturer in the industry. 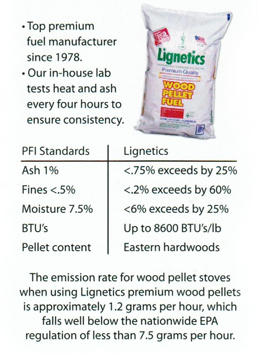 With more than 30 years in the wood pellet industry, Lignetics is one of the founding pioneers of manufacturing premium wood pellets for home heating. Lignetics wood pellets are 100% renewable and are generated from recycled sawdust at lumber and flooring manufacturing facilities that could otherwise be destined for landfills. And, although trees are a renewable resource, Lignetics doesn’t destroy any forests. Only all-natural materials are used in the production of Lignetics wood pellets, ensuring a clean and safe burn that have emissions below most state and federal emissions requirements. They burn hot and clean with virtually no smoke or creosote deposits. Since these wood pellets burn cleaner and safer than traditional stoves, your home insurance may cost less than with a wood stove. Did we mention how convenient Lignetics pellets are? Picture the same warm, cozy heat as a wood stove but without the hassle of chopping and hauling wood, nasty hidden bugs and spiders, a stowaway mouse, or continuous sweeping and cleaning of bark and wood chips. With Lignetics, the pellets come inside 40-pound plastic bags—which are recyclable—that are waterproof, easy to stack, and require less ash to sweep up. Another top brand we stand by for effective, efficient home heating is Energex. Manufactured in Mifflintown, PA, Energex produced premium wood pellets for homeowners throughout our state and nation. These wood pellets are made from fine blends of softwoods and/or hardwoods that produce a clean, safe, and environmentally friendly burn for your home heating each winter. When you think about heating with wood, you may worry about a potential mess. With Energex wood pellets, you can be worry-free! These pellets provide an ash content well below 1%, which is the industry standard, so you can heat your property cleanly with the energy source you trust. In addition to all of these benefits, and because of them, Energex has earned the prized distinction of PFI certification. Undergoing test after test for quality assurance, the Pellet Fuels Institute dubbed Energex as Quality Standard Certified for the high, consistent quality of their wood pellets. If you would like to learn more about wood pellets or you have questions and comments, please contact us today!